Every proper Indian meal includes a nice, cooling raita. Authentic Indian food is spicy and those who know have a yogurt-based raita on the side to cool things down if the fire alarm starts ringing. 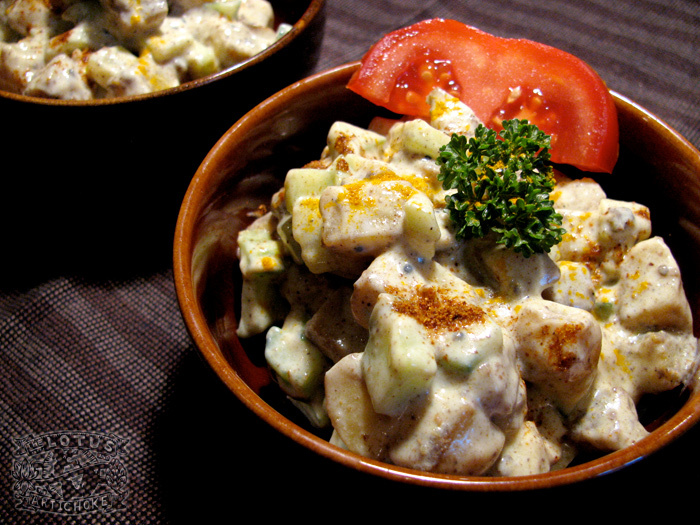 A delicious side dish and appetizer, many a raita is just raw cucumber, tomato, onion, carrot, and/or bell peppers. I like this hybrid with cooked potatoes and cool cucumbers. It’s sort of cross between a classic vedic yogurt potato dish (which I learned from the Hare Krishnas in the 90s), more traditional Indian raita (which I learned in countless variations in India, particularly living in Amravati) and what most of the world knows as potato salad. But with creamy soy yogurt instead of regular yogurt or mayo!